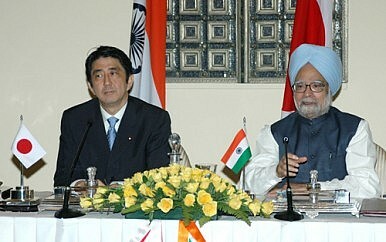 With the former Prime Minister once again at the helm of the LDP, relations with India could receive a further boost. In 2006 Abe Shinzo, appointed again last week as leader of the ​Liberal Democratic Party (LDP), Japan’s main opposition party, wrote; “It will not be a surprise if in another decade, Japan-India relations overtake Japan-U.S. and Japan-China ties.” Such a prediction now, as it was then, is improbable, but the prospect of Abe assuming Japan’s top office could have a dramatic impact on Japan-India ties. Japan-India relations have developed significantly since their nadir in the late 1990’s. Opposing views on the possession of nuclear weapons following India testing in 1998 divided the two, as Tokyo imposed uncharacteristically severe sanctions on Delhi. However, as India’s economy has grown following the consolidation of liberalization reforms, and China’s influence has risen in tandem, India once again has entered Japan’s diplomatic radar. China was never far from Abe foreign policy’s focus and through “shared values” rhetoric, the India relationship became framed around the “Quad” initiative between the U.S., Japan, Australia and India. Support for the “Quad” gradually fizzled due to concerns over alienating Beijing, as Abe’s own political power waned. Since then, relations have centered on economic ties. Japanese businesses have, albeit slowly, grown to appreciate the potential of the Indian market, with its growing middle class and vast potential for infrastructure development. The prospect of India one day serving as an export hub to Africa and the Middle East also remains in corporate minds. Furthermore, just as in 2005 when violent anti-Japanese riots spread across China, encouraging Japanese firms to diversify their business models, the recent flare-ups over the Senkakus/Diaoyu Islands may have a similar effect. India remains a challenging market but with companies such as Toyota and Nissan temporarily scaling back production in China in anticipation of reduced sales, alternative strategies will emerge.